Looking out at the Skelligs Rocks from a beach below the Skelligs Chocolate Factory on Friday morning, I was told that the Skelligs Rocks had once belonged to the Butler family of Waterville. 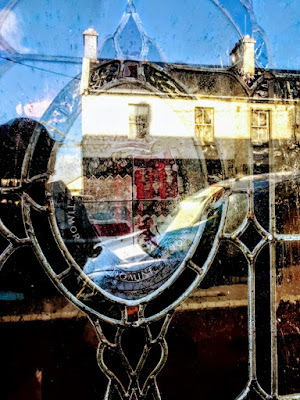 The previous evening, we had dinner in the Fisherman’s Bar at the Butler Arms Hotel in Waterville, where the stained-glass windows in the pub front are engraved with fading versions of the Butler coaty-of-arms. 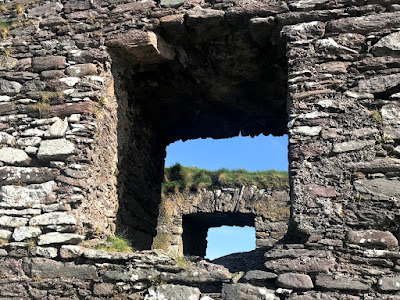 So, I naturally began to wonder was there a thread in this visit to Ballinskelligs that brought together the Skelligs Rocks, the Butlers of Ormond and the hotel and restaurant in Waterville. A number of factors in the 13th century forced the monks to abandon their monastery on Skellig Michael: there was a general deterioration in the climate in this part of Europe, bringing with it colder weather and increased storms; the structures of the Irish Church had changed, shifting from an emphasis on the monasteries to the diocesan structures; and, with the reorganisation of the church came the reorganisation of monastic life, so that while a rocky eerie suited the eremitical community on Skellig Michael, the Rule of Saint Augustine suited a more stable existence on the mainland and in the new Priory at Ballinskelligs. 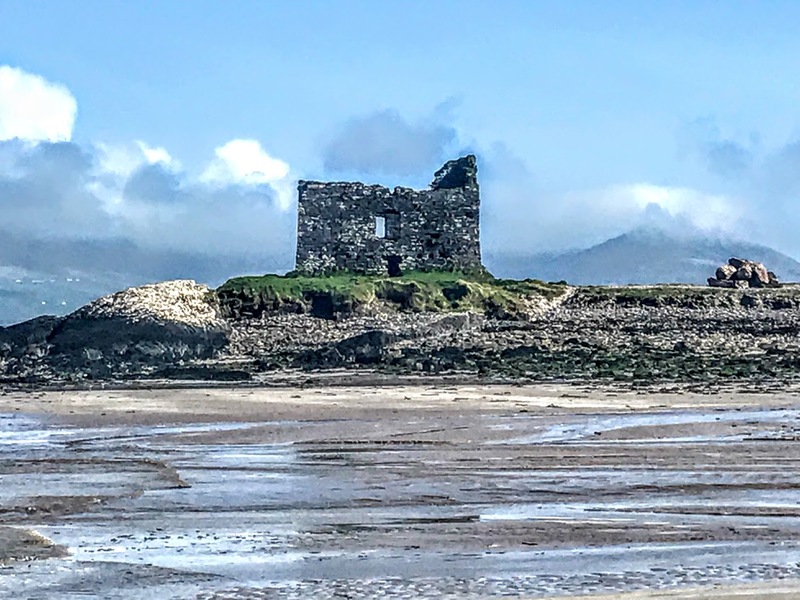 The Prior of the Augustinian Abbey at Ballinskelligs was referred to as the Prior de Rupe Michaelis in the early 14th century, implying that the island still formed an important part of the monastery at that time. Indeed, Skellig Michael appears on a number of Italian and Iberian portolan charts from the 14th to the 16th centuries. But the dissolution of the monastic houses at the Reformation brought an end to monastic life at Ballinskelligs, and the monks lost their grip on the Skelligs Rocks. 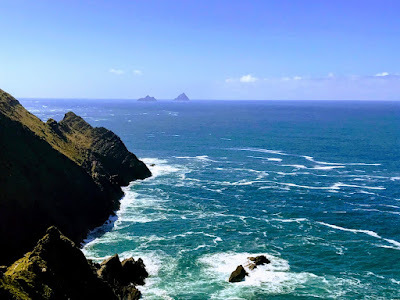 In 1578, the Skellig Islands passed to the Butler family. The accounts of the Spanish Armada show that the island was known to them in 1588, and the monastery on the rocks continued to be a place of pilgrimage into the 18th century. The island was bought by the predecessors of the Commissioners of Irish Lights in 1821 for £780 from the Butler family of Waterville. Two lighthouses along with living quarters for the lighthouse-keepers and their families were built on the island and the lighthouses were first commissioned in 1826. The Commissioners also built the present east landing and a road along the south and west side of the island to facilitate building the two lighthouses on the west side of the island. The upper light was decommissioned in 1870 after the introduction of the lighthouse at Inishtearaght. Meanwhile, the Office of Public Works took the monastic remains into State guardianship in 1880 and began a project for the repair of collapsed structures. The current lighthouse was fully automated in 1987. The lighthouses and surrounding buildings continue to be owned by the Commissioners of Irish Lights which maintains and operates lighthouses around Ireland. The Office of Public Works continued to repair and conserve the monastic remains. In 1989, the State bought the island from the Commissioners of Irish Lights, with the exception of the working lighthouse and ancillary areas. In 1996, Skellig Michael was added to the UNESCO World Heritage List. 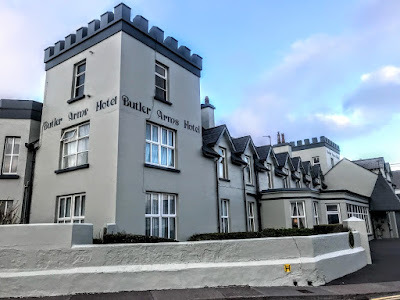 But who were the Butler family of Waterville who gave their name to the Butler Arms Hotel and a public fountain? Waterville is known in Irish as An Coireán, meaning ‘The Little Whirlpool’ or ‘The Sickle.’ ‘The Sickle’ refers to the shape of Ballinskelligs Bay on which the town sits, and the name has been transplanted onto the lake, whose Irish name is Loch Luíoch or Loch Luidheach. The landowning families in Waterville and the surrounding area included the Marquess of Landsdowne, the Hartopps and the Butlers. The Butler family built a house at the mouth of the River Currane at the end of the 18th century, and named their house and estate Waterville. The house sits on a narrow isthmus facing the Atlantic with Lough Currane on its east side. The Currane River divides the 50-acre estate in two as it flows into Ballinskelligs Bay. The village that developed on the estate in the early 19th century was also named Waterville. But this Butler family was not a branch of the Ormond Butlers of Kilkenny Castle. 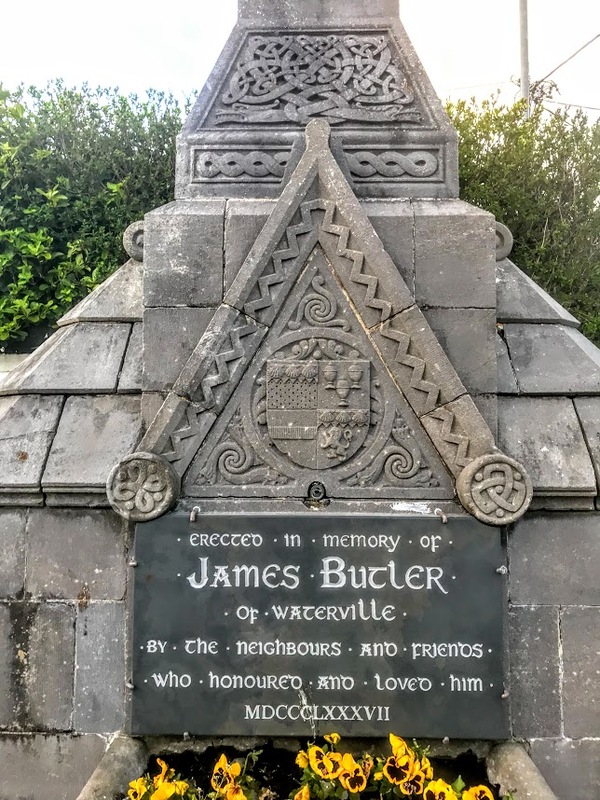 The Butlers of Waterville were descended from Whitwell Butler, a younger brother of James Butler of Priestown, Co Meath, and a descendant the Butlers of Dunboyne. The Priestown Butler family included many members of the Church of Ireland clergy: the Revd Dr Richard Butler, was Vicar of Burnchurch, Co Kilkenny; and three of his sons were priests, including the Very Revd Richard Butler (1794-1863), Dean of Clonmacnoise and Vicar of Trim, who married into the Edgeworth family. 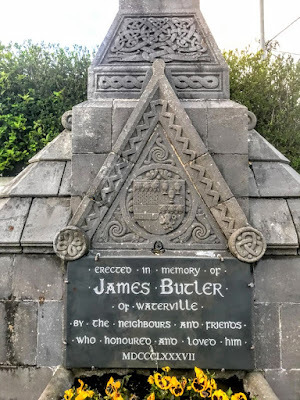 Whitwell Butler’s elder brother, James, was the grandfather of John Butler of Maiden Hall, Co Kilkenny, and he in turn was the grandfather of the Irish writer Hubert Butler of Maiden Hall. Whitwell Butler received his unusual first name from his maternal grandfather, Sir Nathaniel Whitwell, an alderman of Dublin in the early 18th century. He probably moved to the Waterville are when he married into the Yielding family, and his other properties in the area included Belville. In the 1830s, Whitwell Butler of Belville was the agent for the Blennerhassett lands in Caher Parish. 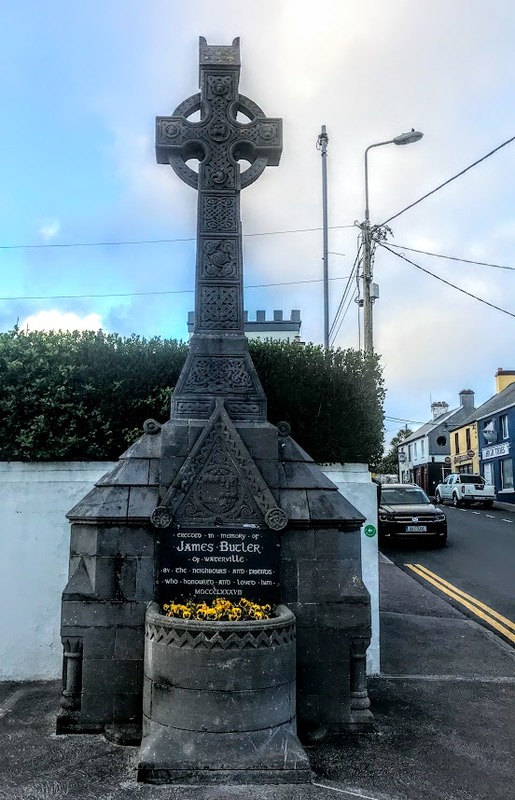 His son, James Butler married into the Day family, a well-known clerical family in Co Kerry, and Agnes Day was also descended from the Fitzgerald family, Knights of Kerry, who owned most of Valentia Island. Agnes and James Butler were the parents of James Butler (1820-1887) of Waterville, who owned over 1,400 acres in Co Kerry in the 1870s. This James Butler also owned Ballyglassin House, which he inherited from his father-in-law, Roger Green Davis, and was among the principal lessors in the parish of Ballinadee, barony of East Carbery, Co Cork. At the same time, Arabella Butler owned over 700 acres. The Congested Districts Board bought over 150 acres of the Butler estate in Co Kerry in 1906-1909, and in 1916 the board offered to buy over 500 acres of the Butler estate then owned by minors, including James Whitwell Butler of Waterville House, and his brothers John Hubert Butler and Edward Vincent Butler. The Butler family continued to live at Waterville House until 1965. It is now a luxury hotel with a golf links nearby. Belville continued to be used by the Butler family until the end of the 20th century, but it is now unoccupied and in poor repair. Meanwhile, the Butler Arms Hotel opened in Waterville in March 1884. 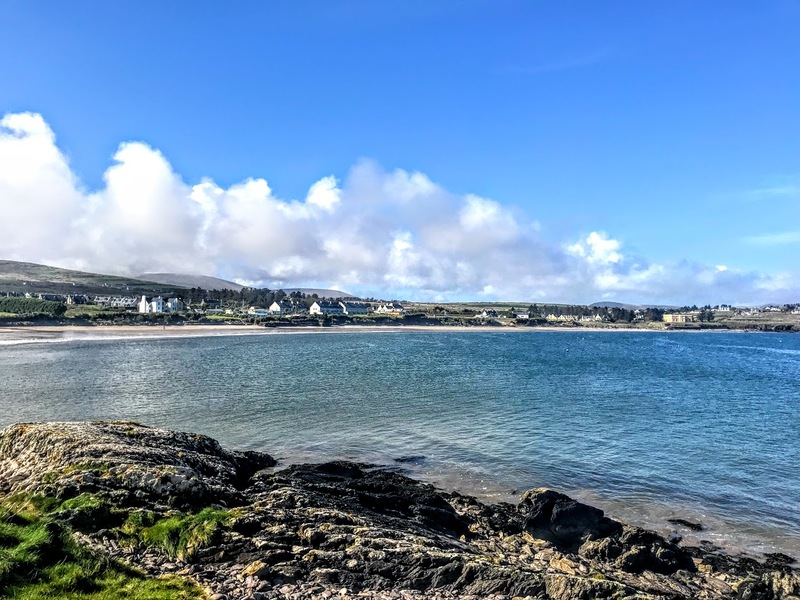 In the same year, the Commercial Cable Company established a transatlantic cable station in the village while the Direct United States line had already one at Ballinskelligs and the first cable had been laid into Valentia Island a quarter of a century before. The memorial was designed by the Kerry-born architect, James Fraklin Fuller (1835-1924), whose works include Farmleigh House in the Phoenix Park, Dublin, the Superintendent’s Lodge in Saint Stephen’s Green, Dublin, alterations to Saint Mary’s Church, Julianstown, Co Meath, the terracotta-decorated D’Olier Chambers on the corner of D’Olier Street and Hawkins Street, Dublin, and the Church of Ireland parish churches at Saint Brendan’s, Kilnaughtin (Tarbert), and Saint Augustine’s, Ballybunion, both in my parish. The Butler Arms Hotel was bought by Martin and Mary Huggard in 1916 and has continued in the Huggard family to the present day. The hotel guest list includes names such as Charlie Chaplin, Walt Disney, Michael Douglas, Catherine Zeta-Jones and Michael Flatley. Sigerson’s Bar is the only remaining pub in Dungeagan. There I listened to stories from Rosie, who gives her name to Tig Rosie, and from some of the customers at the bar about old Ballinskelligs. They recalled the teenagers and the teachers who came to the Irish College year by year in the 1960s, John Joe and his biscuit boxes, and the old tales told by Seán Mhártain Uí Shúilleabháin (1890-1975), who was the sheanchaí at Coláiste Mhichíl for many years. 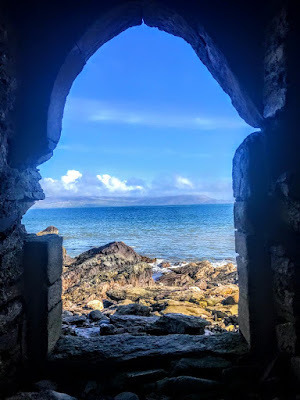 As teenagers, we had heard stories of the ‘murder hole’ at Ballinskelligs Castle, pirates and the bodies of dead monks. So, late on Thursday afternoon, after visiting the ruins of Ballinskelligs Abbey, I continued out along the isthmus that stretches out into Ballinskelligs Bay on its western shoreline to visit Ballinskelligs Castle. The McCarthy Tower at the end of this isthmus is known locally as Ballinskelligs Castle. It was reputedly a McCarthy stronghold and was probably built in the 16th century by the McCarthy family, powerful chieftains in Cork and Kerry at the time. A more romantic version of the story says the castle was built much earlier in the l2th and 13th century. This was a time when battles were taking place between the McCarthy Mór, the Gaelic Kings of Desmond who ruled South Kerry, and the FitzGeralds, Earls of Desmond, who ruled North Kerry. Ballinskelligs Castle also had some associations with the nearby priory, known Ballinskelligs Abbey, which was survived until 1538 and the dissolution of the monastic houses during the reign of Henry VIII. It is possible that the Priory was in McCarthy Mór hands in the mid-16th century and it may have housed a garrison. Local lore says that after a storm, a hole opened up at a point between the priory and the McCarthy Tower and skeletons and skulls were exposed. Each skull was cut in the front as if by a sword or axe, and the skeletons were said to be the those of the monks of the abbey. The castle was also the manor held by the Sigerson family in the early 17th century, and in 1620 the abbey came into the possession of Christopher Sigerson. Later in the 17th century, the castle was used as a pilchard-curing station as part of the fisheries set up by Sir William Petty. Following the erosion of a large area of land at the south and east sides of the castle, John Sheehan and Anne O’Sullivan carried out excavations at the castle in 1988-1991. They uncovered the original ground floor, formed of large paving slabs, beneath a build-up of storm material. The entrance on the south-east or seaward side features a doorway of punch dressed sandstone. A hole runs through from the doorway to a mural chamber on the north-east side to allow for a chain to operate the grille. There is also a space for a draw bar on the inside of the door. Above the door is what is said to be a murder-hole. The castle was originally a three-storey tower, and the corbels for these floors still exist. We climbed the mural stairway in the south corner to the first-floor level, and the stairway does not seem to have gone any further than the second floor, and in the past a ladder was probably used to reach the roof. Excavations on the south side have indicated traces of two lean-to structures, both dating from after the primary period of occupation of the castle, and most of the finds on the site are from a post-mediaeval date. We walked back along the isthmus to the priory and crossed a narrow footbridge across fens and marshland to the long sandy beach again. The story telling continued that evening in Sigerson’s Bar in Dungeagan.